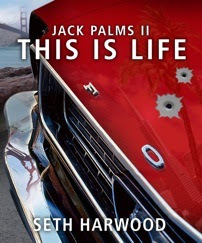 So I just got off of a Skype call with Seth Harwood, author of Jack Wakes Up , This Is Life and a short story collection A Long Way From Disney. First off it was really cool that he took the time to give me an interview about writing and how a story comes together for him. I would have like to have chatted longer but he had to take his dog for a walk, it you have a dog you know how demanding they can be not to mention the fact that you don’t want the dog to have a accident while he was waiting for you to get your act in gear. Any how now I have this nice audio file to edit and but in my next show, I think it will work out nicely. Seth is a guy that you would like to have a pint with and shoot the breeze, I think I’ll just have to got out west buy him that beer. So do your self a favor and hear over to www.sethharwood.com and check out his podcasts, you wont be disappointed!